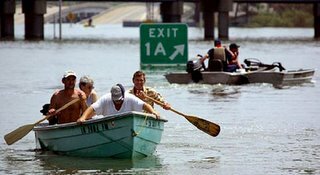 Remember images like these from Hurricane Katrina in August 2005? Seems just like yesterday the catastrophe hit New Orleans. However, if I were one of these people in the picture, I imagine it would feel like one of the longest years of my life. I remember watching the news for weeks after the hurricane hit and having a deep desire to want to go and do something to help. I wanted so badly to do my part as an American, as a human being, and as a Christian for the victims of Katrina. Well, I had no idea one year later that silent prayer would be answered. I leave for a mini-mission trip to New Orleans tomorrow! I'm so excited, and so humbled to be a part of the reorganization and clean-up of New Orleans. We're going to be working with Habitat for Humanity, a non-profit organization, and going down the the French Quarters District to do some street evangelism! Should be a weekend of fun, serving, and good fellowship. Please pray for God to be glorified, safe travels, and for lives to be touched by the outpouring of people who desire to minister as Christ's hands and feet in New Orleans. I promise to update on Monday when I return!